We’re Building Another Machine Tool! Bardons & Oliver is currently building a machine tool specifically for the hydraulic and pneumatic cylinder market. 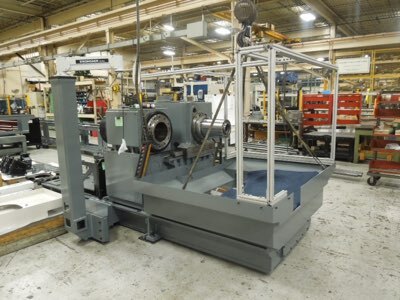 One of our many customers producing hydraulic cylinders purchased a B&O 2SC-850 fully automated CNC Machining System. The machines highlights include a FANUC CNC Control, a Renishaw probe system, live tooling with thru-tool coolant, and large capacity thru bore (8.50” diameter). The spindle system boasts 1,600 maximum rpm and 50 max horsepower spindle motor. Included is a fully automatic material handling system for the raw material and finished parts. Material and part contact surfaces contain our Non-Mar Technology to protect material from scratching, scoring and denting. Contact one of our employee-owners about this system along with one of many other systems B&O has to offer.